When supercar and uber luxury car manufacturers get together with masterclass timepiece makers, the result is going to be both obnoxiously expensive and strikingly beautiful. These two new timepieces are no exception. 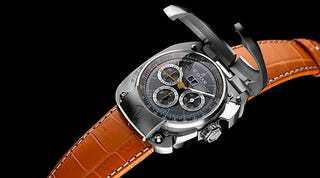 The first, above, is a collaboration between Swedish supercar maker Koenigsegg and watchmaker EDOX. The hinged flaps are supposed to make one think of the gullwing doors on Koenigsegg CCR supercar. However, priced at a cool $21,000, it makes me think of how poor I am. Only 30 will be produced, which is fitting given the number of CCR's there are out on the roadways today.